For many years employees working within the confines of Manchester Civil Justice Centre have complained of leaks. On numerous occasions cover ups and botch jobs have been attempted to cure the leaks but consistently failed. 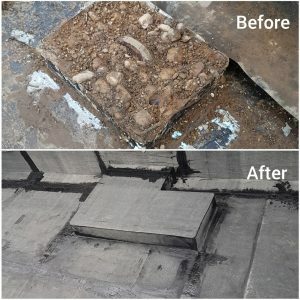 After being alerted of the on-going and persistent leaking, we at CADMAY visited site and carried out surveys with a representative from RADMAT Building Products, where the decision was made to strip back all the existing waterproofing membrane to the original substrate within the problem areas and carry out the re-application of PQ6100 PermaQuik membrane. As the project now draws to an end, having successfully passed electronic leak testing and the firm reassurance from staff that leaks are now a thing of the past. It gives us great pleasure being involved with such a project on a very prestigious building.